I started volunteering for the Mid Atlantic Great Dane Rescue League, Inc. (MAGDRL) in 2007. It was a wonderful experience, which allowed me to meet a lot of like-minded people interested in helping animals. My main responsibility as a volunteer was to attend Meet and Greet events. At these events we would bring Great Danes as well as information about the rescue. My message to everyone who would stop by our table was simply to adopt. Maybe a Great Dane isn’t right for you and that’s okay, but please adopt from a shelter or rescue if you are looking to add a pet to your family. Don’t they look cute together? My Dachshund Lily also loved attending these events. The Great Danes were always so calm and Lily the Dachshund was always running around like crazy trying to jump up and greet them. One dog in particular caught Lily’s attention immediately. 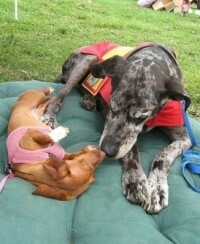 Lily instantly fell in love with Goober, a ten-year-old Great Dane. Lily loved him for a variety of reasons. The main reason she loved Goober was he was older, so once he laid down, he couldn’t get up easily and run away from Lily like the others. Goober’s adopter, Beth, told me Goober always seemed indifferent about dogs, but with Lily it was different. He would even go as far as grooming her when they were cuddling. Clearly they were crowd pleasers! Dogs can teach us a lot of things, and I think this is a great example of true love in its purest form. This Thanksgiving, make sure you tell those dear to you, human and pet alike, how much you love them.